September 23, 2015 Gary GambleDirectors, Festivals, Indie Cinema, NEWS, Trailers, upcoming releases to watch out for . 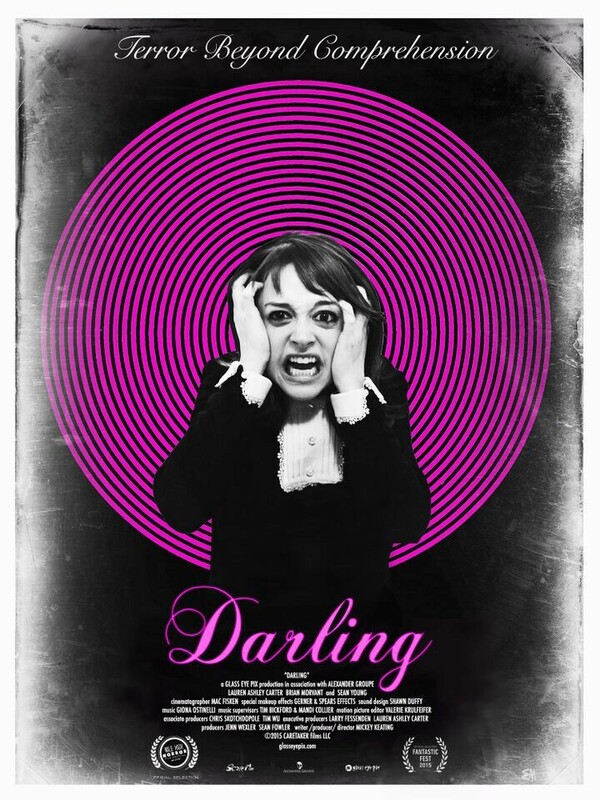 Countdown to the World Premiere of DARLING at Fantastic Fest, Festival Poster and Teaser Revealed! Mickey Keating’s DARLING set to World Premiere at Fantastic Fest 2015, festival poster and teaser trailer revealed! Mickey Keating’s new feature is a chilling black and white psychological horror story beautifully shot in New York City. Edited like a nightmare and scored like a hallucination, DARLING stars Lauren Ashley Carter (POD, JUG FACE) with supporting performances by Brian Morvant, Sean Young, Larry Fessenden, John Speredakos, and Helen Rogers. Produced by Fessenden and Jenn Wexler for Glass Eye Pix and Sean Fowler for Alexander Groupe. Keating and Carter are also producers and composer Giona Ostinelli returns from the director’s previous feature to score this film. Poster art featured here done by Erin Mealing..
With his previous film POD fresh off of its theatrical release, writer, director and producer Mickey Keating accomplishes terror of a completely different kind with the stunningly horrific DARLING. DARLING will world premiere at the 11th edition of Fantastic Fest in Austin, Texas. The festival runs from September 24th to October 1st.